The Ink Business Unlimited℠ Credit Card, which is the latest addition to Chase's Ink credit card line, is a flat-rate small business card that offers cardholders an unlimited 1.5 percent cash back on every purchase. Given its no-annual-fee nature and that flat-rate cash-back opportunity, this card would be an excellent complement to the Ink Business Preferred℠ Credit Card with which you earn three points per $1 spent (3 percent, essentially) on travel and some business categories, but only one point (1 percent back) on your other purchases. More on how to maximize your rewards by combining these two cards below. The Ink Business Unlimited℠ Credit Card, which doesn't have an annual fee, lets you redeem rewards (you get them in the form of highly useful Chase Ultimate Rewards® points) for gift cards and travel, too. The card offers added benefits for new card members, including an introductory 0 percent APR on purchases for the first 12 months (then, 15.49% - 21.49% Variable). There's also a welcome bonus opportunity: New card members can earn $500 bonus cash back after spending $3,000 on purchases in the first three months. Plus, being a business card, it allows card members to add employee cards to the account at no additional cost. You can set individual employee spending limits and money spent on those cards will help you earn rewards faster. Pay no annual fee and rack up some healthy rewards at 1.5 percent cash back on all your purchases without the hassle of caps or categories to keep up with. Take your business to the next level – or help it get off the ground – with 12 months no interest on purchases (15.49% - 21.49% Variable after the intro period). Used alongside the Ink Business Preferred℠ Credit Card , you can earn three points per $1 (or 3 percent cash back) in certain business categories and 1.5 percent back on everything else. Flat-rate cash-back cards are great options for business owners who spend regularly in a wide variety of categories, but if a big chunk of your spending is in a particular category, like travel or office supplies, you stand to earn more rewards with a card that offers bonus rewards in those categories. The Ink Business Unlimited℠ Credit Card is a cash-back card, but since your rewards accumulate as Chase Ultimate Rewards® points, it gives you the flexibility to use what you earn in other ways. With the Ink Business Unlimited℠ Credit Card, you can pool points you earn with those you earn from other Chase cards with Ultimate Rewards®, including the Ink Business Cash℠ Credit Card or the Ink Business Preferred℠ Credit Card. You can combine points from those cards and then use all your points together for a redemption. If you choose to redeem your points for travel through the Ultimate Rewards® program, remember that Ink Business Preferred℠ Credit Card members' points – even those they've pooled from other cards – are worth 25 percent more when redeemed for travel through the portal. So, rather than getting a 1:1 redemption of your points with the Ink Business Unlimited℠ Credit Card, you can pool those points with the Ink Business Preferred℠ Credit Card for a better reward value and get even more from your cards. Here's another reason why it's a smart idea to pair this card with another in the Ultimate Rewards® program. Let's say you have an Ink Business Preferred℠ Credit Card, which gives you three points for every $1 spent on travel; shipping purchases; and Internet, cable and phone services (up to $150,000 spent annually), but it only gives you one point for every $1 on all your other purchases. You can get strategic with these two cards by using your Ink Business Preferred℠ Credit Card for the purchases in which you get three points per $1 and then the Ink Business Unlimited℠ Credit Card for other purchases since you get 1.5 percent back on all your purchases with that card. Then, as discussed above, move all your points into the Ink Business Preferred℠ Credit Card bucket (it's easy to do via your online account) so you'll receive 25 percent more value when you redeem for travel through Chase Ultimate Rewards®. If you're willing to pay an annual fee and you know your business spending is highly concentrated in particular categories, you can get a better cash back rate than the 1.5 percent that the Ink Business Unlimited℠ Credit Card offers. Additionally, there is an issue for international travelers. The Ink Business Unlimited℠ Credit Card charges a 3 percent fee on international purchases. That could be a problem if you travel abroad; it's also potentially another reason to use this card in combination with the Ink Business Preferred℠ Credit Card, which doesn't charge foreign transaction fees. 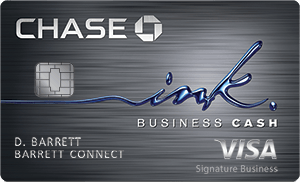 The Ink Business Unlimited℠ Credit Card and the Ink Business Cash℠ Credit Card are similar in many ways. They both offer free employee cards, don't charge an annual fee, charge a 3 percent foreign transaction fee and have the same introductory cash back bonus offer and introductory APR period (the APR goes to 15.49% - 21.49% Variable with the Ink Business Cash℠ Credit Card). One significant way that they're different, however, is that the Ink Business Unlimited℠ Credit Card gives you 1.5 percent cash back on all purchases. 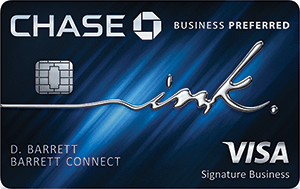 The Ink Business Cash℠ Credit Card gives you 5 percent cash back on the first $25,000 spent in combined purchases at office supply stores and on Internet, cable and phone services within an anniversary year; 2 percent back on $25,000-worth of combined purchases each year at gas stations and restaurants; and 1 percent cash back on all other purchases. It's another opportunity – this one lacking annual fees for both cards – to strategically use your credit cards in order to maximize your rewards. The SimplyCash® Plus Business Credit Card from American Express (American Express is a CardRatings advertiser) offers you 5 percent cash back on the first $50,000 spent each year on wireless telephone services purchased directly from U.S. service providers and at office supply stores. It also gives cardholders the flexibility to choose one of eight categories in which you'll earn 3 percent cash back on the first $50,000 spent each year. Categories include airfare; hotel stays; car rentals from select companies; purchases at U.S. gas stations; purchases at U.S. restaurants; advertising purchases with select media; U.S. shipping purchases; and U.S. computer hardware, software and cloud computing purchases made directly from select providers. The remaining purchases earn you 1 percent cash back. The SimplyCash® Plus Business Credit Card from American Express doesn't charge an annual fee but does charge a 2.7 percent fee for each foreign transaction. Terms apply; See Rates and Fees. Much like with the Ink Business Unlimited℠ Credit Card, the Capital One® Spark® Cash Select for Business credit card gives you 1.5 percent cash back on all purchases and doesn't charge an annual fee. The Capital One® Spark® Cash Select for Business credit card's introductory bonus ($200 when you spend $3,000 in the first three months) and introductory APR period (nine months, then, 15.24% - 23.24% (Variable)) aren't as generous as with the Chase card. However, the Capital One® Spark® Cash Select for Business credit card doesn't charge foreign transaction fees, so it's a better option if you need to use the card during frequent travel abroad. The Ink Business Unlimited℠ Credit Card is an excellent option for business owners looking for a card without an annual fee and that offers a simple-to-remember rewards program. The card also makes sense for people with other Chase cards that operate on the Ultimate Rewards® program, so you can take advantage of each card's perks and pool your points to get the most out of your rewards.